Morocco is the magical spot of Northern Africa. With its energetic and ancient cities, rugged deserts and mountains, spices and music and creativity, Morocco enchants. Few places in the world offer such cultural, social and geographical diversity. Located on the North West coast of Africa, Morocco has coastline on the North Atlantic Ocean as well as the Mediterranean Sea, and is framed on other sides the Sahara Desert and stunning mountain ranges such as the High Atlas, the Chefchaouen Mountains and the Oregano Mountains. 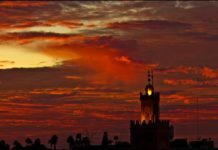 The most familiar city to most of the world is the imperial city of Marrakech, with its abundance of historical sites, mosques, palaces and tombs, and its medieval medina. One of the pleasures of Morocco lies in getting lost while wandering its maze of streets. The heart of the medina is Djemaa el Fna, the large square where, it seems, most anything can be found. When I first arrived there, I simply wandered around fascinated, soaking it all in. Here was a snake charmer, there a man with a trained dancing monkey. Nearby is a group of musicians and drummers, while across the way cross-dressing dancers perform in veils. Carts surround it all, selling everything from spices and orange juice, to potions handed down through generations. Many of the items on the potion carts are unrecognizable, although I did see dried lizards and some sort of hair with which the proprietors will presumably whip up an elixir to make someone fall in love or cast an evil spell on an enemy. Through it all, women call to you to have your fortune told or your hands henna painted. Just off the square is the opening to the never-ending souk – another wandering trek among incredible wares, and through which you will never emerge where you think you must be. Prepare to get lost – and prepare to pay a local to lead you out! All part of the adventure. The souks are a great place to purchase exquisite rugs, lamps, and a plethora of other items; be ready to haggle when you’ve decided to shop. When night begins to fall, Djemaa el Fna square is bathed in sunset light and converted to a large outdoor dining area. Hundreds of food stalls spring up as if by magic, and suddenly the white tented roofs cover the cobblestones. Here you can stroll along until you see something that beckons, then sit down on the benches next to other patrons to enjoy! 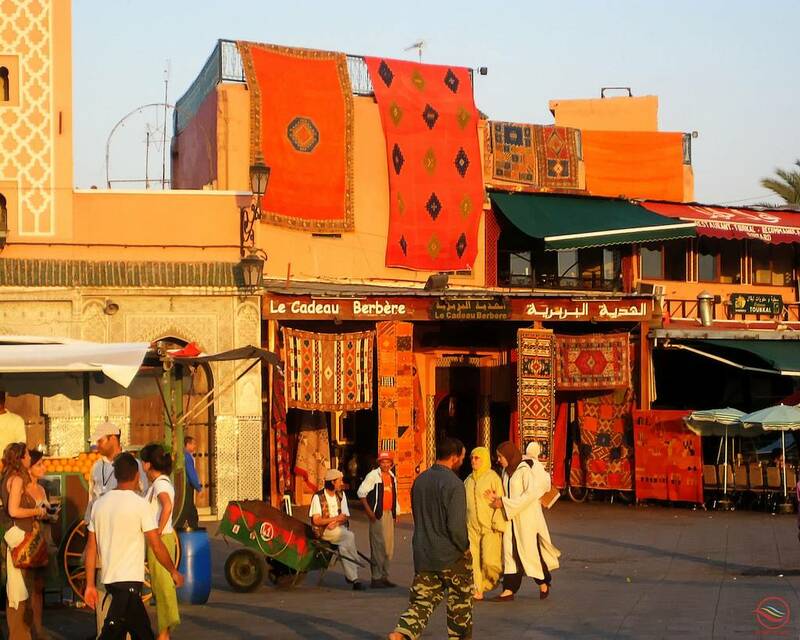 Marrakech’s Djemma el Fna, the city’s massive square in the medina or old city, is like no other. Snake charmers, acrobats, musicians, monkey handlers, fortune tellers, traditional healers, dentists and water sellers all compete for attention beckoning passers by and fascinated tourists. And this is just during the day. Prime time to visit Djemma el Fna is at dusk when the square really starts coming to life. Food vendors with plumes of smoke hovering over their stalls set up en masse among the sea of humanity. Diners feasting on local delicacies occupy the outdoor eateries. Enthusiastic crowds, six people deep gather around storytellers narrating ancient tales. Nearby the drums of musicians beat well into the night. Be warned. If you stop to watch performers or take a photograph you will be expected to pay a tip and be pursued if you don’t. A few dirhams will usually do. Another good way to take it all in is from one the roof top cafes overlooking the square, which UNESCO declared a World Heritage site in 2001. In the Sa’adian Tombs complex, Marrakech’s richly decorated royal mausoleums dating from the 16th century are surrounded by gardens and sun-snoozing cats. Admire the domed ceilings, ornate plasterwork, marble pillars and intricate carvings in the mausoleum rooms. It’s one of the most visited sites in Morocco. From the Djemaa el Fna, follow Rue Bab Agnaou south outside the ramparts. At the end is a small square flanked by two gates; through the gate on the left (Bab Agnaou, from Almohad times) is the kasbah mosque. The narrow passageway to the Sa’adian tombs is well-signposted at the right-hand corner of the mosque. In its heyday, the El Badi Palace was filled with gold, onyx and Italian marble, displaying the finest materials and craftsmanship for the royal court and the sultan’s many guests to admire. Built in the late 16th century, its glory did not last long, for it was largely destroyed just over a hundred years after its completion. Storks nest on its high walls, looking down on vast empty courtyards, water channels and pools, and out across city rooftops to the mountain-hung horizon. Climb the stairs to join them and the view takes your breath away. The palace comes to life for two weeks in summer when it’s the setting for the National Festival of Popular Arts. Kettaras, 11th-century underground irrigation canals, still supply Marrakech’s gardens with water, alongside more modern systems introduced by the French. Amid acres of olive groves, the pool and pavilion of the Menara Gardens look out to the distant High Atlas mountains dusted with snow. Particularly impressive in the late afternoon, it’s a favourite picnicking place for Marrakechis. 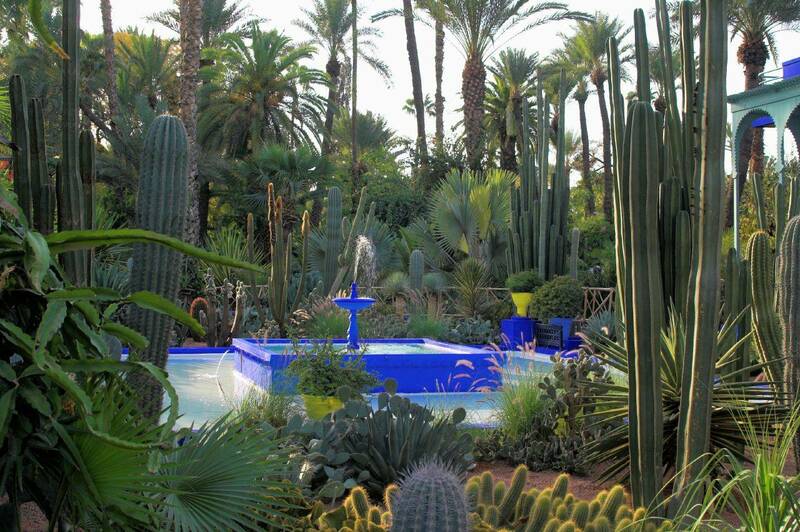 In the walled Majorelle Gardens, made famous by couturier Yves St Laurent, terracotta-tiled paths meander among tall cacti, papyrus and bamboo, pools are lazy with lotus and waterlilies, exotic plants drip with colourful blossoms. Painted in vivid cobalt blue, the studio of the garden’s original owner, the French artist Jacques Majorelle, now houses the Museum of Islamic Art with an exquisite collection of jewellery and ceramics, textiles, carpets and carvings. A cheap taxi ride from the city centre, it’s like stepping into another world. Avenue de la Menara, about 2km from the old city. Open daily from 5 am until around 6.30 pm. Free admission. The No. 11 bus will take you from the Medina to the gardens. Marrakech has been a trading city for a thousand years. In the dense maze of the médina labyrinthine souks run one into the other, each specialising in goods from spices to slippers, carpets to clothes, leatherwork to lanterns, wool to wood. Go in the early morning or late afternoon when it’s fascinating but less crowded, and remember that everything closes on Fridays. Bargain for babouches, the pointy-toed, backless leather slippers in a rainbow riot of colours and richly embroidered suede. Look for djellabahs with pointy hoods, straight out of Star Wars, and invest in a tagine, a tall, cone-lidded, glazed terracotta cooking pot. Walk away with marvellous baskets, blue and white or yellow and green pottery, leather, silks and scarves in myriad shades, brooches in traditional Berber designs, intricate metalwork lanterns, wrought iron candleholders and beautiful thuya wood boxes inlaid with marquetry or mother of pearl. If your budget doesn’t stretch to a carpet, consider a small rug or woven saddlebag. At the end of the day, step out from the souks for a reviving mint tea on the top terrace of the Café-Restaurant Argana or the Café de France. See the sun set over the pink-walled city, gaze out to mountain peaks defined in the distance, and watch as the Djemaâ el Fna square comes to vibrant life below you. The Dar Si Saïd Palace, its walls patterned with mosaics, its tiled courtyards decorated with pink marble fountains, has Berber jewellery and carved daggers, a collection of beautiful carpets and intricate, 500-year old wood carvings displayed under painted ceilings. From there it’s a short walk to the Maison Tiskiwin, a private museum which displays a fine collection of jewellery, fabrics, carpets and musical instruments in a traditional courtyard house secreted behind a very plain frontage. As well as carpets, jewellery, ceramics, manuscripts, furniture and textiles, the Museum of Marrakech, housed in the beautifully restored 19th-century Dar M’Nebhi Palace by the Ben Youssef medersa, displays contemporary art in the large courtyard that’s swathed in a domed tent. With 200 towers and 20 gates, Marrakech’s pink-red walls and ramparts stretch for miles. Go through the defensive Bab Debbagh gate on the east side and you come to the famous tanneries – if you can take the smell, and most people can’t, it’s a mind-boggling scene. The dyeing process has hardly changed for centuries.